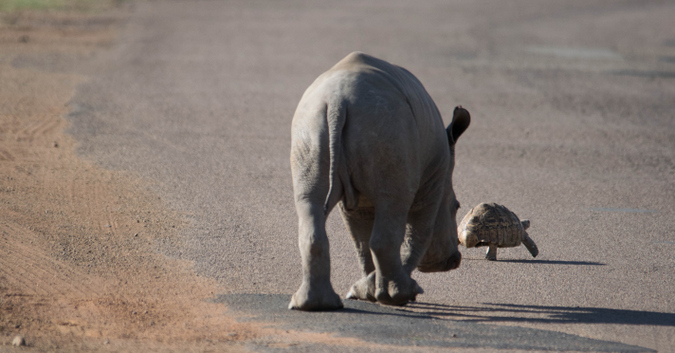 A Baby Rhino & His Tortoise | Luxury Safari Experts | African Safari Co. Nature is unpredictable, which is precisely what makes it so addictive. Every safari that I have ventured on has taught me that the excitement present in a game viewing vehicle is heavily influenced by the thrill of uncertainty as to what you might see. So, as I boarded my safari vehicle on a beautiful day in October, 2017, the air was ripe with the breath of adventure. And I, an amateur photographer, was ready for the unexpected. While driving along one of the roads we came across a sighting I am certain that I will treasure forever. 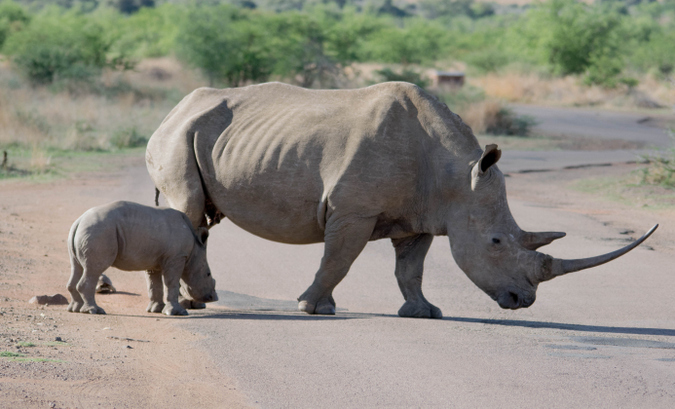 A white rhino and her calf stood, waiting to cross the road. The scene initially appeared to show no out-of-the-ordinary occurrence as our cameras snapped away at the beautiful animals. The rhino, displaying a very protective instinct over her calf, decided to wait until she was certain that our vehicle posed no threat to them. Deciding that it was safe, she strolled to the other side, but had reached there without her little one. Her calf, it seemed, had given in to its curiosity and playfully proceeded to investigate a leopard tortoise that was nearby. The tortoise, clearly not liking how close the calf was getting, made a fierce attempt to get away and eventually retreated into the safety of its shell. The rhino mother just looked on patiently. 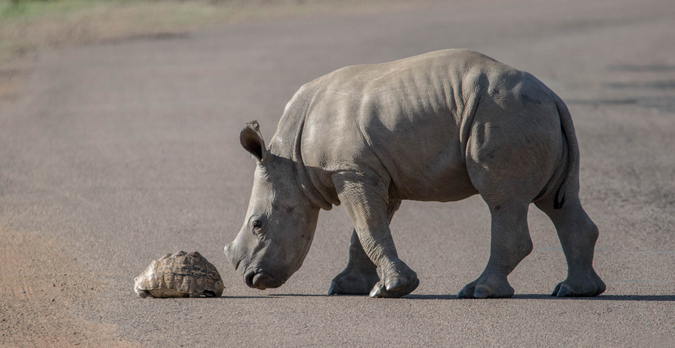 From a bystander’s perspective, it seemed as though the rhino calf wanted to play with the tortoise, who would have none of it. Soon after, the calf returned to its mother and they continued on with their journey. 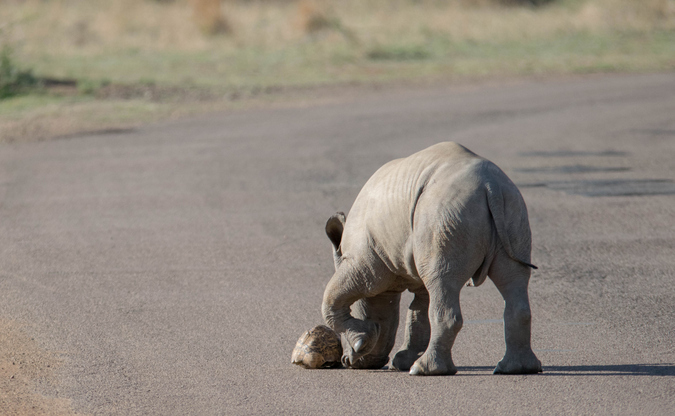 Who would have thought that in my travels I would experience the joy of watching a baby rhino attempt to befriend a leopard tortoise, and that I’d have the opportunity to capture the moment and look back at it time and time again. Watching the calf attempt to play with the tortoise had brought laughter and joy to our company as we watched on. I believe this was a unique and rare sighting, considering the plight that rhinos currently face. In truth, I wish that I could promise this mother rhino the life to raise her calf in the way that nature would have it. And I wish that all rhino calves would have a full life, where they may continue to play, discover and heed to their curiosities on African soil that is just as much theirs, as it is ours. Where I would rather observe a charming calf innocently playing with a tortoise, others would see it be orphaned in order to feed their human greed. In conclusion, I would like to say that yes, nature is unpredictable, but what I do know for sure, however, is that I would rather live in a world where our rhinos have the freedom to play rather than be human prey.